Being one of the most famous figures in American history, and easily the most famous Philadelphian, the name of Benjamin Franklin can be found throughout the city. Many travelers come from over the Ben Franklin Bridge, Franklin Square is one of the five main squares, and there is, of course, the beloved Franklin Institute. However, Franklin Court has the distinction of being from his time, and to visitors today is solely dedicated to the life of Benjamin Franklin. This courtyard is located in the middle of the block, as the post office and printing shop, both founded by Franklin, occupy the Market Street side. To the south, there’s a narrow alleyway next to the National Liberty Museum that leads to the courtyard. On the buildings along Market Street, exhibits highlight Franklin’s role in the printing industry in early America. The Printing Office gives demonstrations of 1700’s printing methods, with reproductions of printing presses from the time. National Park Service rangers perform these demonstrations, and crowds may be moved along if it is busy. On the other side of the courtyard, B. Free Franklin Post Office is an active post office, but it also has artifacts from colonial times. The house in which Franklin lived has since been demolished, although a white frame stands on the site of the original house. Parts of the basement have been excavated, and are visible beneath a sheet of glass properly positioned to prevent light from coming in. They may be small and in poor condition, but yet it’s fascinating to think that Benjamin Franklin lived his daily life walking on the floorboards down there. Floor plans show what the layout of his house was like. A smaller frame exists on the former site of the print shop, which was also demolished. 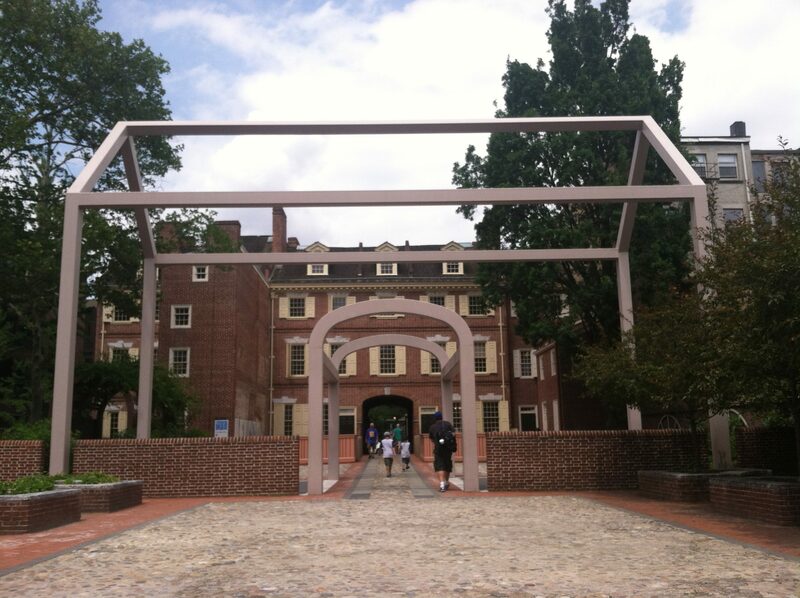 Another highlight is the Ben Franklin Museum, which is located in the southwest corner of the courtyard. This family-friendly museum documents Franklin’s life through a variety of displays, including animations and audio clips. It’s very kid friendly, and is very interactive. The museum focuses less on what Franklin did, but rather who he was. Therefore, the museum is divided into sections highlighting aspects of his personality, rather than his physical accomplishments. Despite that, it still contains several artifacts from the time, as well as everyday things that were invented by Franklin. All of the sights in Franklin Court are free, except for the Benjamin Franklin Museum. That costs $5 for adults, and $2 for children.